Nicole-Mary Handy has reached middle age--and it is not treating he well. Divorced, and involved with a married man, she is inspired by her friend's death to take the trip to Paris she has dreamed of her entire life. What Nicole expects to be a month visiting the sights and learning French morphs into something else when she discovers a photo of her father--and of the mystery woman whose picture she found hidden in her home as a child--among a collection of items from an estate. Nicole knows that she has no choice to find out who this woman is and, ultimately, who she herself is. First off, let me apologize for this write up being a little fragmented. This is one of those time when I really don't want to get into the specifics of the story as I think the reader really needs to discover them his or herself. Thus, I'm going to be "talking around" things quite a bit here. Just bear with me. All in all, I enjoyed this book. I will admit that, for about the first 25% of the book, I just couldn't get into it. Then, there came a point when I was just sucked in. I felt the 3 main female characters were incredibly well-written. It would have been very easy, given this story, to slip into cliches with these 3 women. 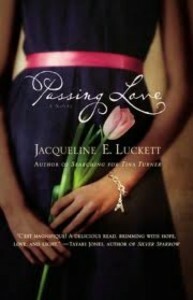 However, Luckett was able to to create 3 believable, yet flawed, human characters. She also resisted the temptation to give this story what I would call a "Hallmark ending." It wasn't a perfect book--I felt that the secondary characters were not as successful as the primary ones. I also felt that Nicole's relationship with Laurent, a French journalist was unneeded. While the bulk of this story takes place in Paris, I didn't get that much of a Paris feeling from it all, although I did learn quite a bit about the expat African Americans in Paris in the mid-twentieth century. While I didn't find this a perfect book, I did enjoy it enough to recommend it to others. It was an entertaining summer-read and I think fans of Women's Fiction will enjoy it as well. June 25 - Life is Short. Read Fast. July 2 - "That's Swell!" I'm glad that you did enjoy this overall even though it wasn't a perfect read for you. Thanks for being on the tour!